Dr. Lim holds the Drs. T. J. and Ella M. Arneson Land-Grant Chair in Human Behavior at the University of Minnesota where he is a Professor of Psychiatry and Vice Chair for Research. 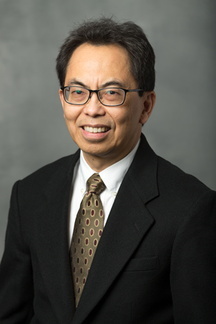 Dr. Lim began his undergraduate work at the Massachusetts Institute of Technology, completing his Bachelor and MD degrees at Johns Hopkins University. He completed a psychiatry residency and fellowship in neuroimaging at Stanford University where he also served on the faculty in the Department of Psychiatry. He joined the University of Minnesota in 2001. Camchong J, MacDonald AW 3rd, Nelson B, Bell C, Mueller BA, Specker S, Lim KO. Frontal hyperconnectivity related to discounting and reversal learning in cocaine subjects. Biol Psychiatry. 2011 Jun 1;69(11):1117-23. Epub 2011 Mar 2. PubMed PMID: 21371689; PubMed Central PMCID: PMC3090521. Wozniak JR, Mueller BA, Muetzel RL, Bell CJ, Hoecker HL, Nelson ML, Chang PN, Lim KO. Inter-hemispheric functional connectivity disruption in children with prenatal alcohol exposure. Alcohol Clin Exp Res. 2011 May;35(5):849-61. doi: 10.1111/j.1530-0277.2010.01415.x. Epub 2011 Feb 8. PubMed PMID: 21303384; PubMed Central PMCID: PMC3083458. Porter JN, Collins PF, Muetzel RL, Lim KO, Luciana M. Associations between cortical thickness and verbal fluency in childhood, adolescence, and young adulthood. Neuroimage. 2011 Apr 15;55(4):1865-77. Epub 2011 Jan 19. PubMed PMID: 21255662; PubMed Central PMCID: PMC3063407. Kanellopoulos D, Gunning FM, Morimoto SS, Hoptman MJ, Murphy CF, Kelly RE, Glatt C, Lim KO, Alexopoulos GS. Hippocampal volumes and the brain-derived neurotrophic factor val66met polymorphism in geriatric major depression. Am J Geriatr Psychiatry. 2011 Jan;19(1):13-22. PubMed PMID: 21218562; PubMed Central PMCID: PMC3058412. Wozniak JR, Mueller BA, Ward EE, Lim KO, Day JW. White matter abnormalities and neurocognitive correlates in children and adolescents with myotonic dystrophy type 1: a diffusion tensor imaging study. Neuromuscul Disord. 2011 Feb;21(2):89-96. Epub 2010 Dec 18. PubMed PMID: 21169018; PubMed Central PMCID: PMC3026055. Franc DT, Kodl CT, Mueller BA, Muetzel RL, Lim KO, Seaquist ER. High connectivity between reduced cortical thickness and disrupted white matter tracts in long-standing type 1 diabetes. Diabetes. 2011 Jan;60(1):315-9. Epub 2010 Oct 27. PubMed PMID: 20980455; PubMed Central PMCID: PMC3012188. Sponheim SR, McGuire KA, Kang SS, Davenport ND, Aviyente S, Bernat EM, Lim KO. Evidence of disrupted functional connectivity in the brain after combat-related blast injury. Neuroimage. 2011 Jan;54 Suppl 1:S21-9. Epub 2010 Sep 17. PubMed PMID: 20851190. Haut KM, Lim KO, MacDonald A 3rd. Prefrontal cortical changes following cognitive training in patients with chronic schizophrenia: effects of practice, generalization, and specificity. Neuropsychopharmacology. 2010 Aug;35(9):1850-9. Epub 2010 Apr 28. PubMed PMID: 20428109; PubMed Central PMCID: PMC3055638. Cullen KR, Klimes-Dougan B, Muetzel R, Mueller BA, Camchong J, Houri A, Kurma S, Lim KO. Altered white matter microstructure in adolescents with major depression: a preliminary study. J Am Acad Child Adolesc Psychiatry. 2010 Feb;49(2):173-83.e1. PubMed PMID: 20215939; PubMed Central PMCID: PMC2909686. Camchong J, MacDonald AW 3rd, Bell C, Mueller BA, Lim KO. Altered functional and anatomical connectivity in schizophrenia. Schizophr Bull. 2011 May;37(3):640-50. Epub 2009 Nov 17. PubMed PMID: 19920062; PubMed Central PMCID: PMC3080691.